It took me months to launch my first passive income idea. With this short guide it’ll take you just 2-3 days! Okay, so here’s the deal. After enough research (and reading this site! ), people come up with their lets-freaking-do-it idea. They’ve overcome probably the biggest hurdle to earning money online….working out their idea. Crazy but true. I’d guesstimate that 80% of people who read something like the 4HWW never actually end up working out an idea to launch. So now with killer idea in hand, it’s time to launch this mofo! Now for the few of you who got to this point, this is when things seem to get even tougher. Execution is a biatch. Or is it? Oh yeah, let me say this; I spent literally 2 full days trying to work out who to host my sites with. I read 100s of reviews. From Hostgator to Godaddy to Dreamhost, I read about them all. Every single company has both good and bad reviews out there. People love to publish horror stories. In the end I was more confused than when I started. I ended up choosing Mediatemple because their user interface is sooooo simple to use. With zero expertise at the time I setup my first website within an hour. Love it! And hey, unlike everyone else out there I recommend a web hosting service without an affiliate link so I must freakin love it! PS with Mediatemple, first choose your domain, then they’ll ask if you want to add hosting to that. Easy! This is so easy if you went with Mediatemple. It’s also pretty simple with most other big companies too, thanks to 1-click WordPress install. Find this feature on your host and click away. WordPress will then launch and you can start building your site. Go to Themeforest and find a theme, aka a template, that you love the look of. My advice is that if you are a first time website builder choose a theme where you love the demo site straight up. ie you don’t plan to do much customisation to it. The theme on this site you see is pretty freaking simple and I managed to get setup in about 20 minutes. I bought it from Themeforest and it cost a measly $35 or something. Too easy! UPDATE: I recently totally rewrote my free ebook on my favorite passive income ideas and added a whole section on how to launch your idea the smart way. I also greatly simplified the process. So I deleted the rest of this rather out-dated article. To get my very latest strategy scroll below and enter your email address to download the ebook. 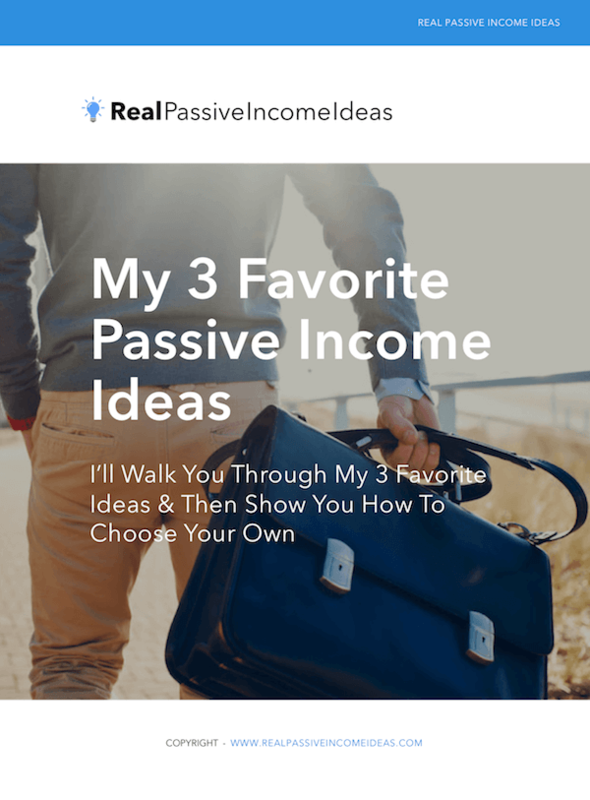 Want to know my 3 favorite passive income ideas in 2019? If you’re struggling to think of an idea or you’ve tried out a few ideas, but can’t seem to eek out more than a couple hundred dollars a month, STOP.